Younger Son, my intrepid companion on this trip, laughs aloud when I express my concern over this. I am known as an “old lady” driver in my family, a description I bristle at – I prefer careful – but we are probably safe from an encounter with the state troopers. I was so happy to be asked at the border: “Purpose of your visit?” and be able to respond, “Visiting Theo Chocolate Factory”. This trip is long overdue. I have been trying to get to Theo since a chocolate-loving family whose opinions I respect raved to me about it after their visit, last fall. And I have been looking for an opportunity to see a bean-to-bar facility in action. We do not have one in Vancouver yet, although my pal Rachel Sawatzky of Cocoa Nymph is working on it. By controlling the chocolate-making process from the farm to the bar, bean-to-bar chocolate makers also strive to make chocolate that preserves the beans’ distinctive flavors. And I really want to see how it is done. After a leisurely detour down the beautiful Chuckanut Drive, off the I-5, Younger Son and I pulled into the friendly, funky Fremont District of Seattle in time for a late lunch. We got into the very long line outside Paseo, a Seattle favorite, for huge Caribbean sandwiches. Almost an hour later, not an unusual wait in line at Paseo, we wolfed down our enormous sandwiches in five minutes. I couldn’t finish mine and wished Elder Son and Lovely Partner had been there to appreciate the caramelized onions, jalapenos and huge pile of pulled pork (Younger Son) and big fat scallops (Me) on the massive fresh baked bun. The Theo factory and store is a five minute drive from Paseo but with the one way streets and heavy rush hour traffic we ran, gasping, into the Theo factory a couple of minutes late. No matter. 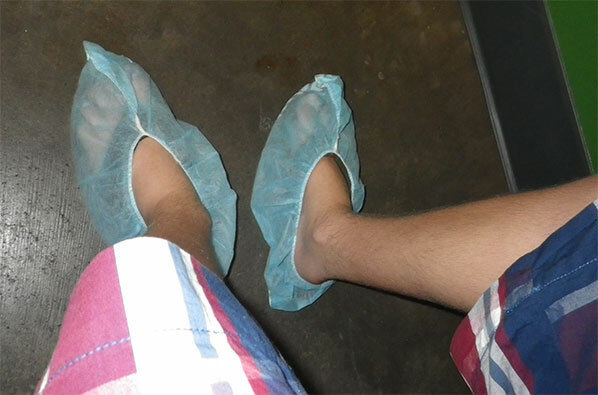 The friendly front desk staff allowed us to catch our breath, rang us in, handed us our fancy blue hairnets (mandatory for a tour of a working food factory) and in Younger Son’s case, blue foot booties, as he was wearing Flip Flops. I assured him it was a good look for him, pointed out that he didn’t have to wear the beard net, and we joined our similarly outfitted tour. Blue hair nets really are a great leveller. Everyone seems friendlier. Our tour guide, the funny and enthusiastic Becca, led us into a spacious room, its wall covered in lively painted images of the steps in cocoa production. 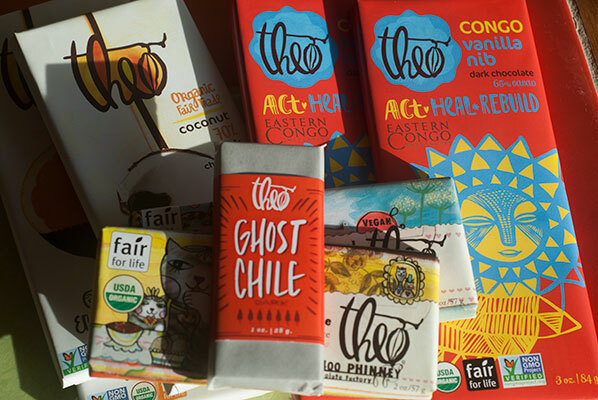 We sat down on log-hewn benches, where she gave us a short history of the theobroma cacao plant, chocolate production, answered questions and gave us generous samples of various different Theo chocolates to try. She did warn us that there would be “plenty more” on the tour, so we should pace ourselves. One of the questions I liked: “What do the beans smell like when they arrive at the factory?”. 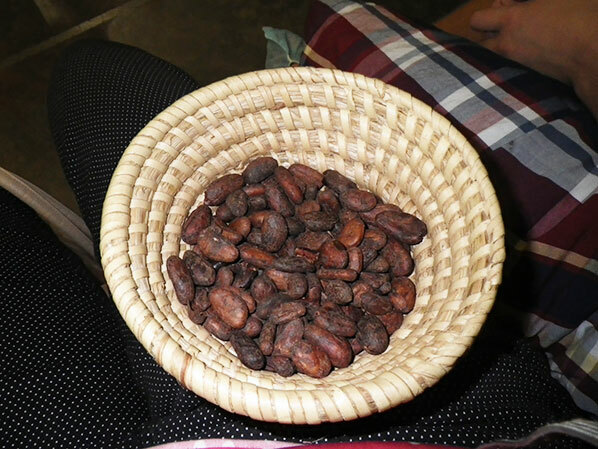 She passes around a cacao pod for us to feel and explains that it takes 10 pods producing about 500 seeds (50 seeds per pod) to produce 1 kilogram of chocolate. I appreciate her passion for cacao as a precious food product. She explains how the pods must be harvested individually using a machete because the tree produces one pod after another, so there are always pods at different points of ripeness on any one tree. I am impressed too, at the concern she and her colleagues have for the welfare of the farmers who grow the cacao, best explained on the Theo “our Story” page. Becca checks our hairnets to make sure our ears are covered and invites us through the heavy doors into the factory. I am hit instantly, with a wave of hot air (pleasantly chocolate scented) as we enter the glass walled observation chamber where Becca shows us all the major machinery involved in turning those vinegar smelling beans into the glorious velvet brown bars in the shop. When Theo started business in 2006, it cost them a million American dollars for their machinery, most of which was sourced from small artisan companies in Europe, who were discarding them. The machines are not actually made anymore. 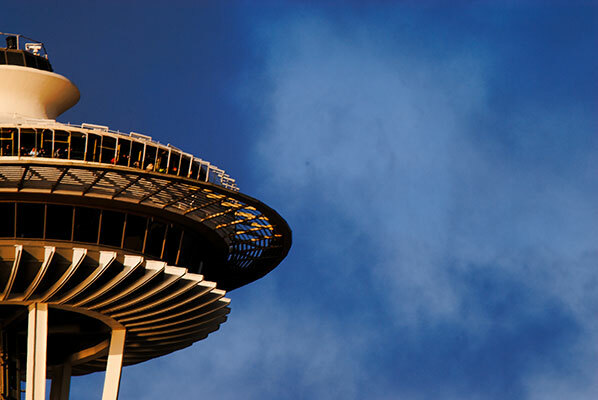 Consequently, when a part breaks down, they have to fix it themselves from parts machined by the squad of repair people who are constantly on call. We look around at the brightly painted machinery which is cleverly colour coded in either yellow, green or red, indicating which part of the cycle the machine belongs to. We gaze at the smaller of two ball roasters, circa 1930. Until last year, it was their only one. Every piece of Theo chocolate had to go through that roaster, being used constantly. With a huge increase in demand, they procured another, bigger ball roster last year, and as we turn around, we can see the sorted beans being poured into its top. I can only imagine what the heat coming off that machine is like, as I am feeling light headed from the heat of this room. This chocolate making is not for the faint of heart …. or head. The whole tour takes about an hour, working our way onto the main factory floor and oh my, it is fiercely hot as we gaze up at the pipeline of chocolate working its way along the pipes from chocolate flake to finished bars. Ending in the test kitchens, we watch chocolatiers and bakers busily working on the summer supply of confectionery and beginning production and recipes for the Christmas line. We are given samples of a lovely lemon curd bon bon and a scotch truffle. Probably not what my light head needs, but they are quite yummy. We end out tour in the shop and I stock up on a selection of their signature bars, plus a dozen filled chocolates for the trip home. 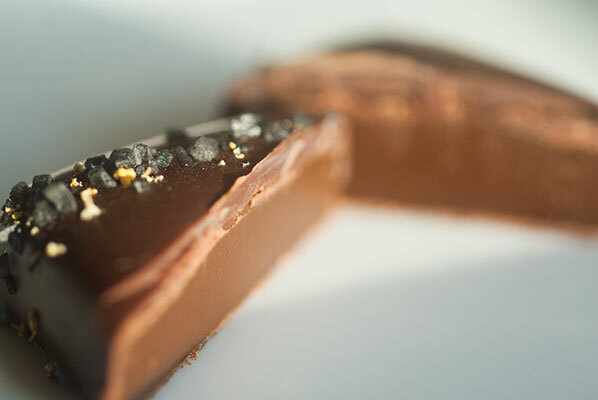 Salted Licorice Caramel – a real surprise to me. I almost passed this one up, thinking the combination would be unpleasant, but the sweetness of the caramel balances the salty licorice in a very satisfying, light not lingering taste. Ghost Chile Caramel – another surprise! It could be due to a lingering head cold, but I loved the taste and bite of this one. I think, once again, the caramel acts as a tempering agent to the force of the chile. Consume slowly to savour every bit of heat! 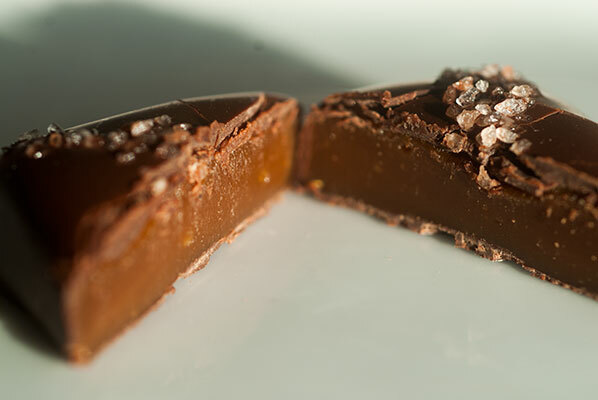 Grey/Pink Salted Caramel – they do good caramel at Theo’s and this one has a lovely texture and balance of sweet/salt. The cherry and raspberry ganaches were also very tasty. I must say, we all tried the dark chocolate mint ganache and oh, what a disappointment! It was, to quote both sons “like chewing a leaf straight out of the garden – stem and all”. I have to agree. This had an aggressive, medicinal mint taste that left an unpleasant grassiness in my mouth. Not to our family’s taste, but I am sure it has its fans. 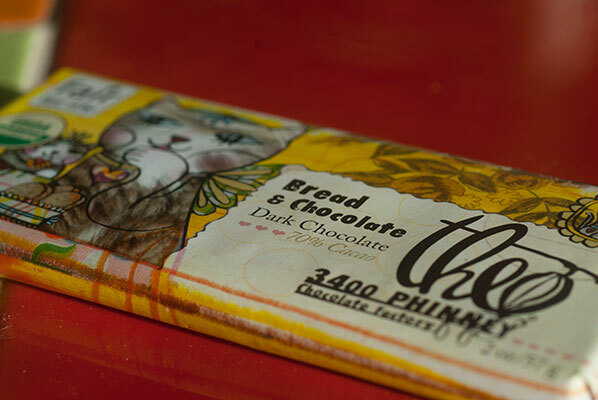 I prefer the Theo bars, with the coconut dark chocolate being my favorite. Nice big pieces of coconut embedded in a 70% dark chocolate. 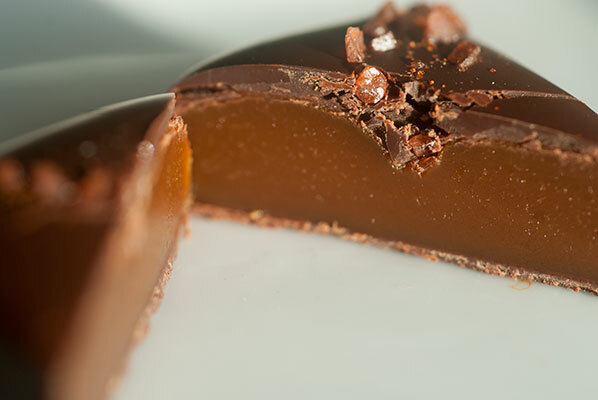 A great balance of crunch and smooth chocolate. My only complaint is that the squares are so big and I couldn’t stop at just one so I am halfway through the 3 ounce bar already. Sons Elder and Younger both vote for the orange which has a good strong hit of orange oil in 70 % dark chocolate. Very smooth and slightly acidic. After sampling almost every bar in the shop, we settled on the Congo Vanilla Nib for the boys’ “significant others”. Proceed from this bar go to the Eastern Congo Initiative to support their work with Congalese farmers in Eastern Congo. Both the cacao and the vanilla used in this bar come from the Democratic Republic of the Congo. A 65% dark chocolate, it has a smooth and creamy “chocolate-y” taste. The Bread and Chocolate Fantasy bar is fun for its crispiness. The bread itself is fairly innocuous and there very much for the texture, although it does provide a slight saltiness. A nice take on a dark chocolate rice krispie bar (not for those who are gluten intolerant). 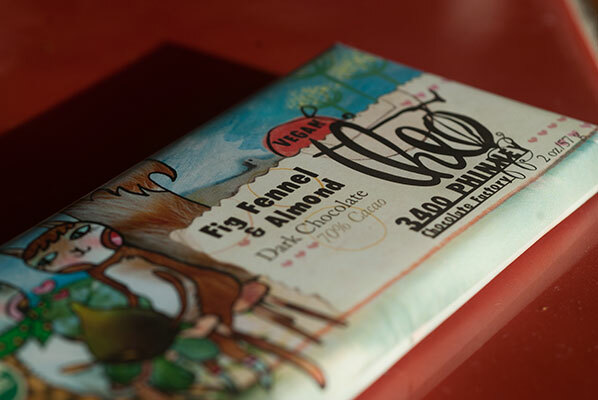 I loved the “meatiness” and the fruitiness of the Fig, Fennel and Almond Bar. One of Theo’s 3 ounce Fantasy bars it is a full, fragrant, chewy mouthful. Mmm, yes. Another mouthful, please. 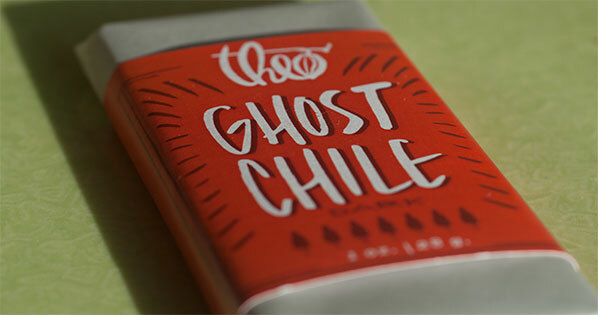 And finally, the Ghost Chili, 1 ounce bar, combining 70% dark chocolate, the hottest peppers in the world (the Ghost Chili), orange zest and salt – WOW! It is initially hot, but once the burn has settled into the rich chocolate flavour, it is really tasty. I think the additions of salt and orange create a nice balance of heat, citrus and salt. It leaves an interesting, but NOT unpleasant metallic taste, after the piece has melted away – I am a fan! 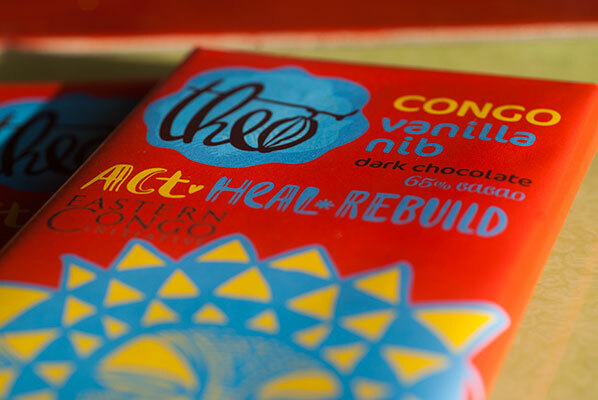 Mmmmm, I can highly recommend Theo Chocolate – not just for its carefully researched, ethically sourced, delicious chocolate bars but also for a wonderfully educational and delicious thing to do if you are visiting Seattle.